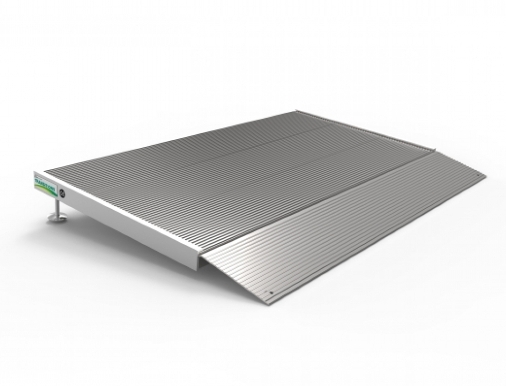 The TRANSITIONS® Angled Entry Ramp is a portable, stand-alone threshold ramp featuring independently adjustable legs with swivel feet, allowing for vertical adjustment ranging from 1-3/8 to 5-7/8 inches in height. The TRANSITIONS® Angled Entry Ramp is a portable, stand-alone threshold ramp featuring independently adjustable legs with swivel feet, allowing for vertical adjustment ranging from 1-3/8 to 5-7/8 inches in height. This free-standing portable threshold ramp is ideal for doorways that swing in and out, uneven surfaces or single step rises.